‘Detective Case and Clown Bot in: The Express Killer’ to Mark the Return of the World’s Worst Detective… Soon! Get ready to annoy passengers aboard the express train from Lisbon to Porto by questioning them, going through their belongings, spending way too much time at the bar, and being a generally incompetent nuisance. Might seem like a rather odd way to go about solving a murder mystery, but it isn’t; not for Detective Case and Clown Bot in: The Express Killer‘s protagonists anyway. Wouldn’t hold my breath for a culprit actually caught, but who needs justice when you can have hilarity? That said… the uncanny duo do need to hurry up if they want to actually, you know, catch the killer, because once the train reach the final station, that’s it. Everyone gets off, and the killer disappears; until he/she/it strikes again. And again. And again. Doesn’t help that Detective Case, aka. the world worst detective, is stuck with a sidekick – Clown Bot – who’d rather be working as a circus clown. Worst sidekick, worst detective – what a team! On top of that, how about some lovely 256×192 resolution for the entire experience? How did they fit an entire train full of peop– oh wait, that’s not how pixels work. Right. Anyway, once you’re done catching ‘The Express Killer’, it’s time to… tackle three additional cases! As the same two absolutely incompetent would-be detectives of course, because why mess with perfection? 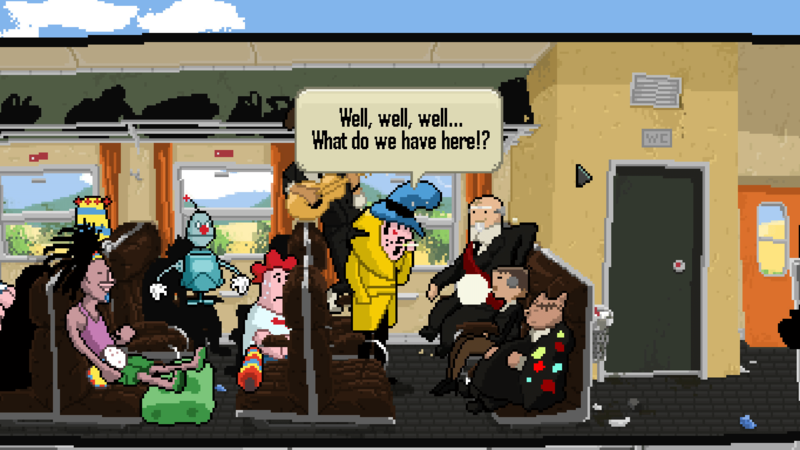 Detective Case and Clown Bot in: The Express Killer will be available from Steam, early 2018.